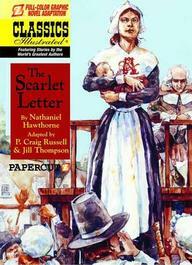 D. H. Lawrence said that there could be no more perfect work of the American imagination than The Scarlet Letter, which makes it ideal material for CLASSICS ILLUSTRATED. Adapted by award-winning graphic novelists P. Craig Russell and Jill Thompson. In addidtion to his incredible graphic adaptations of operas, the fairy tales of Oscar Wilde, and Rudyard Kipling's The Jungle Book, P. Craig Russell is known for both his collaborations with best-selling author Neil Gaiman (The Sandman story "Ramadan") and adaptations of Gaiman's works, such as "Coraline" and "Sandman: The Endless," all of which makes Russell an inspired choice to adapt The Scarlet Letter. Russell broke down the novel into comicbook script form as well as page layouts, providing artist Jill Thompson, also a well-know Neil Gaiman collaborator ("Sandman: Brief Lives"), the foundation for her beautifully painted comics pages.